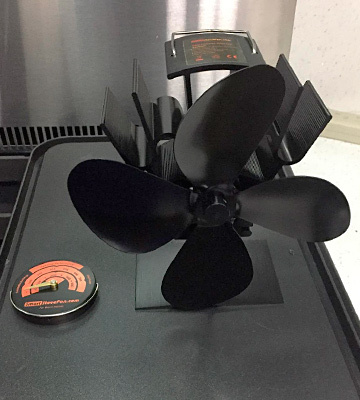 The fans from Ecofan have been tested and proven to reduce fuel usage. By ensuring better heat distribution from the stove, a fan like that will lessen your environmental footprint by up to 18%. 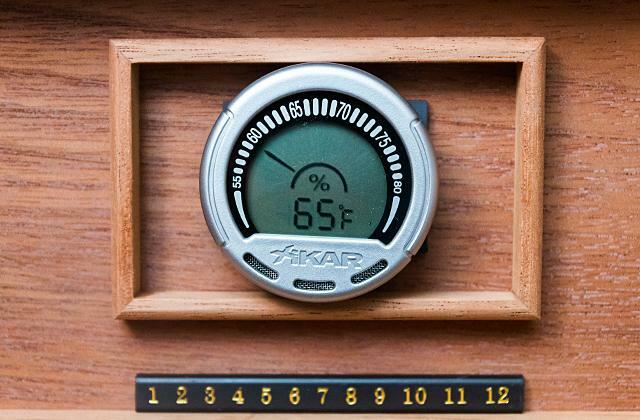 The model warms your room up to 38% faster compared to its predecessor. 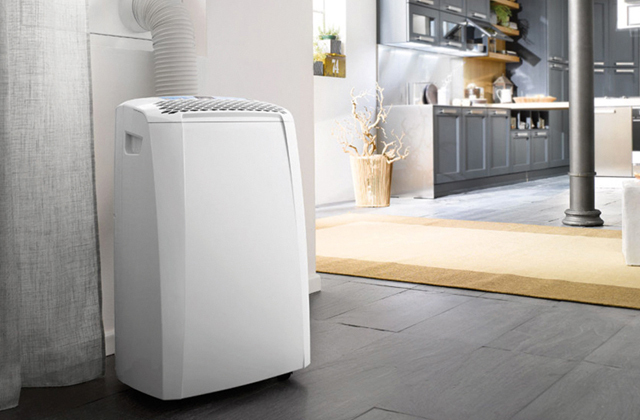 A limited number of cubic feet per minute equates to less powerful airflow. 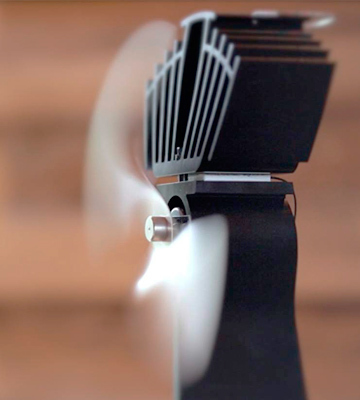 This heat-powered fan features just about everything you would want out of a fan like that. Though some of its more technical characteristics are also up to par, it is the model's environmentally friendly construction and creative design that allows it to be one of the best-selling options on this market. 5.5" x 3.3” x 10"
Since the fan is just a smidge above 7 inches tall, you'll easily be able to find a proper place for it on the wood stove top. An in-built protection system prevents it from overheating. Add to that the fact that it produces less than 25dB of noise and you have yourself a practical and highly useful tool. The handle doesn't attach as well as you'd hope for. 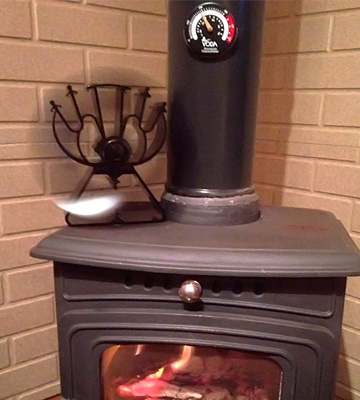 The GALAFIRE N429 circulates warm air throughout the room just as well as the next stove fan. But what sets it apart from those fans are just how safe and silent it is. That and its compact design are the reasons that so many people put their trust in this product. 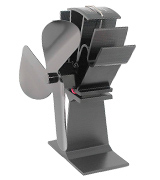 7.1" x 3" x 7.4"
Both the fan base and the model's 4 blades are made of anodized aluminum, a material that is known to be particularly resilient against rust and corrosion. 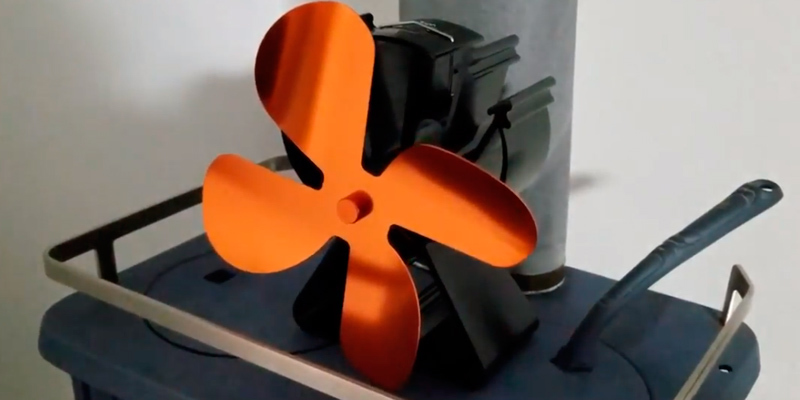 As the fan is capable of delivering up to 240 CFM of airflow, it will be able to move much more air in a minute compared to even the most expensive wood stove fans out there. Despite the stated numbers, it only really starts to work after reaching 200ºF. The wood burning stove fan from Voda is about as innovative as these fans get and far more durable than one might expect. 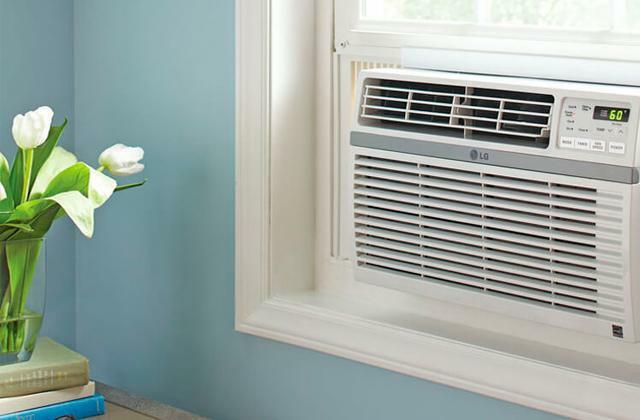 It is an affordable solution that will allow you to heat up the living room. And it comes in 3 colors, so you'll be able to choose the one that matches your décor. 8.5" x 4.5" x 8.5"
Since no batteries or electricity is required, a tool like that isn't just an effective solution when it comes to air distribution but also a rather cost-effective option that will allow you to save some money. 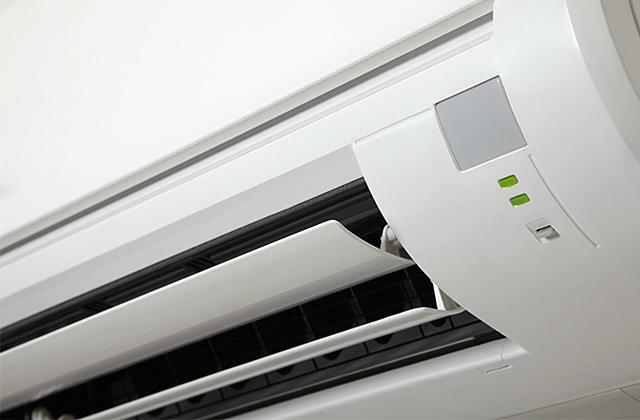 When the temperature reaches a critical point, a bi-metallic safety device will gently elevate the front of the fan to protect the TEG and motor. Some may find it a bit too noisy. Despite the compact design, the model does not trail behind some of the bulkier fans in terms of performance, so it will be able to cover a pretty sizable room and make it a much warmer environment without requiring much of an investment on your part. 6.7" x 3.6" x 8.7"
The foundation is shaped like a maple leaf, a charming little design solution that helps the model stand out. 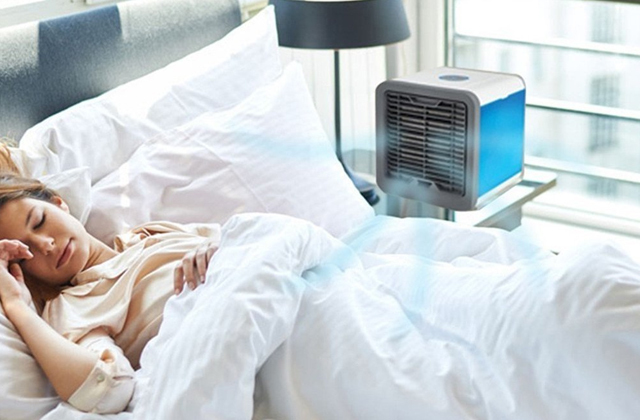 Capable of outputting 350 CFM, the fan will be able to keep a much larger room nice and warm and will take a lot less time to warm that room up. The blades incorporate increased width and a unique shape which lets them better distribute warm air. The model from CWLAKON is one of the most visually appealing and cleverly designed options on this particular market. But don't let its delightful appearance fool you. 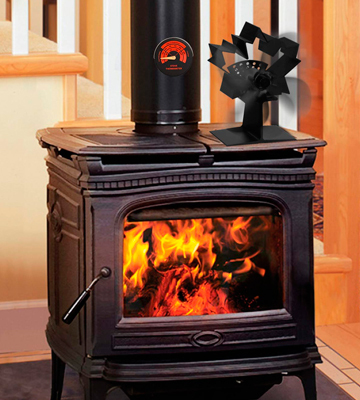 As far as wood stove fans are concerned, the model is an absolute powerhouse that is second to none when it comes to performance. 7" x 3" x 7.1"
With the Ecofan 812AMXBX AirMax, the company's name gives you basically all you need to know about the product. The "fan" part, oddly enough, comes from the fact that we're indeed dealing with a fan. The "eco" part stems from a couple of things. First, there's its non-electric structure. The fan essentially generates its own power by converting the heat from the fireplace into electricity. This way, the blower in question allows you to save money on electricity bills. There's also the fact that it will allow you to burn less wood. 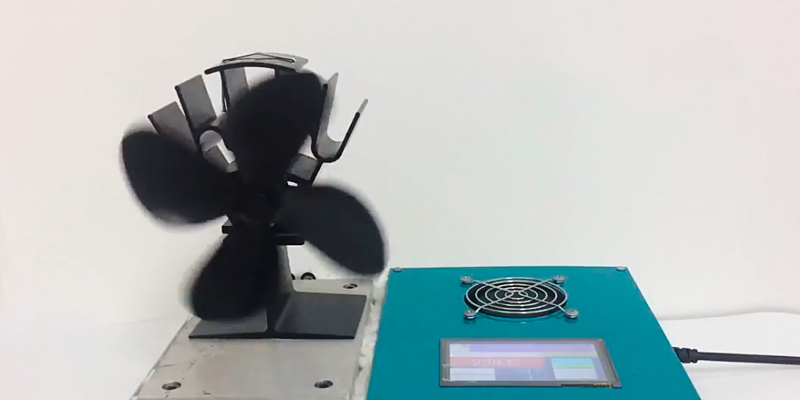 The fans from Ecofan have been tested and proven to reduce fuel usage. By ensuring better heat distribution from the stove, a fan like that will also lessen your environmental footprint by up to 18%. But the best part about this heat-activated fan is easily its self-regulating construction. As the stove starts to heat up, so does the fan, circulating even more air further into the living room. Naturally, the opposite is also true. When the stove starts to cool, the fan itself starts to slow down until it completely shuts off. Aside from the obvious benefits and applications, you can use the fan as an indicator that will tell you exactly when the stoke the fire. 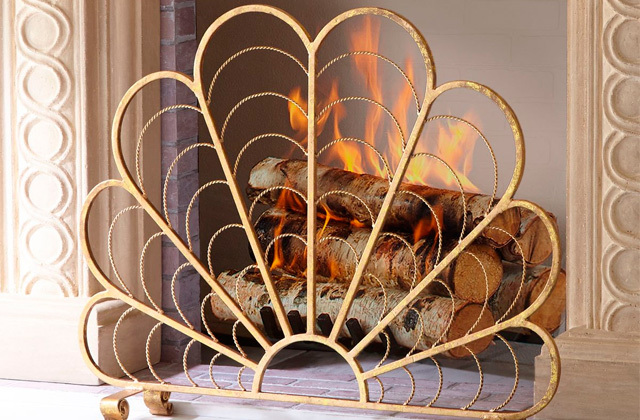 As your fan starts to slow down, you know it is high time to throw some wood into the stove. 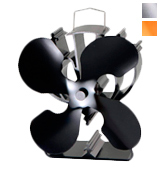 All in all, this heat-powered fan features just about everything you would want out of a fan like that. Though some of its more technical characteristics are up to par, it is the model's environmentally friendly construction and creative design that allows it to be one of the best-selling options on this market. There are a few things that convinced us to put the model from GALAFIRE on our list. Some of them have more to do with the model's design while others are more about its performance and certain construction elements. 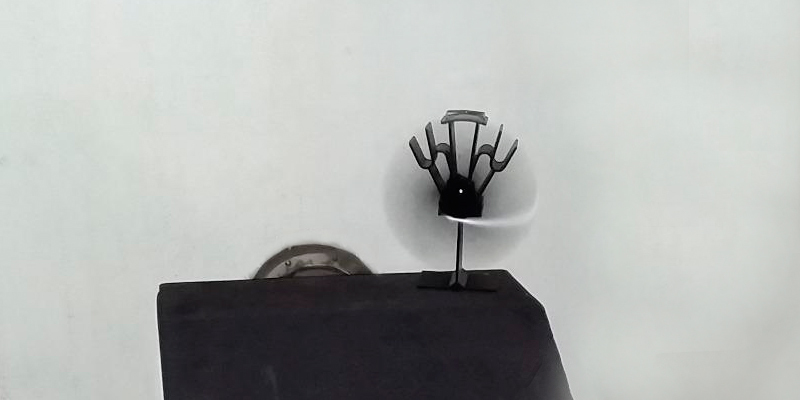 Speaking of the former, we would like to mention the fan's compact frame. The fact that it is just a smidge above 7 inches tall means that you'll easily be able to find a proper place for it on the wood stove top. As for the performance, the model is capable of operating under a wide range of temperatures, starting at 122°F and all the way up to 662°F. And when it actually comes to circulating air, the fan won't let you down either given that it can generate up to 220 CFM, with 4 blades ensuring exceptional airflow and its distribution. Not dissimilar to the majority of these little machines, the model is heat-operated, so you will be able to save up on electricity. 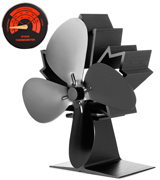 It comes equipped with a magnetic stove thermometer that controls the speed of the fan. 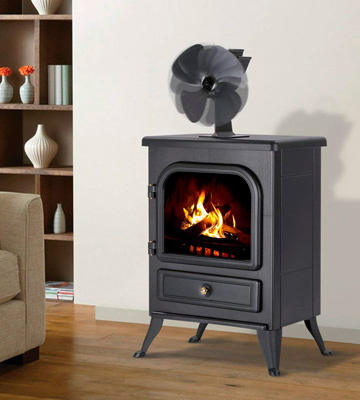 Finally, this heat-driven wood stove fan is also one of the safer options thanks to the in-built protection system that prevents it from overheating. Add to that the fact that it produces less than 25dB of noise and you have yourself a practical and highly useful tool. In short, the GALAFIRE N429 circulates warm air throughout the room just as well as the next stove fan. But what sets it apart from those fans are just how safe and silent it is. That and its compact design are the reasons that so many people put their trust in this product. The people behind this fan from Voda advertise it as innovative and durable. And we don't really know about the former since, as far as we can tell, it is about as innovative as the next stove fan. But we can concur with the durable part. 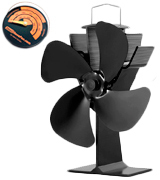 Both the fan base and the model's 4 blades are made of anodized aluminum, a material that is known to be particularly resilient against rust and corrosion. All you need to do is position this tool on a smooth flat surface of the wood stove top. Try to put it near the side or back of the stovepipe. When the surface of the stoves gets hot, the fan will start working on its own, without requiring any assistance on your side. The hotter the stove gets, the faster your fan starts to turn, leading to a better airflow and more warm air circulating in the room. By the way, the latter is what the model does best. As the fan is capable of delivering up to 240 CFM of airflow, it will be able to move much more air in a minute compared to even the most expensive wood stove fans out there. But just like most of these fans, the model in question is heat-powered, so you won't have to waste your money on extra electricity or batteries. The only real issue we have with it is the fact that the tool only starts to work when the surface reaches about 200ºF, which is a different number from the one that's advertised. But, other than that, the wood burning stove fan from Voda is about as innovative as these fans get and far more durable than one might expect. 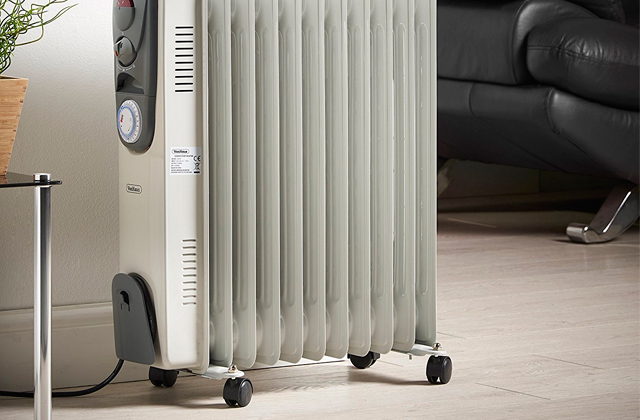 It is an affordable solution that will allow you to heat up the living room. And it comes in 3 colors, so you'll be able to match your décor. There isn't a whole lot we can say on the subject of the Tomersun VDSF613S wood stove fan that we haven't already said about other models in this review. 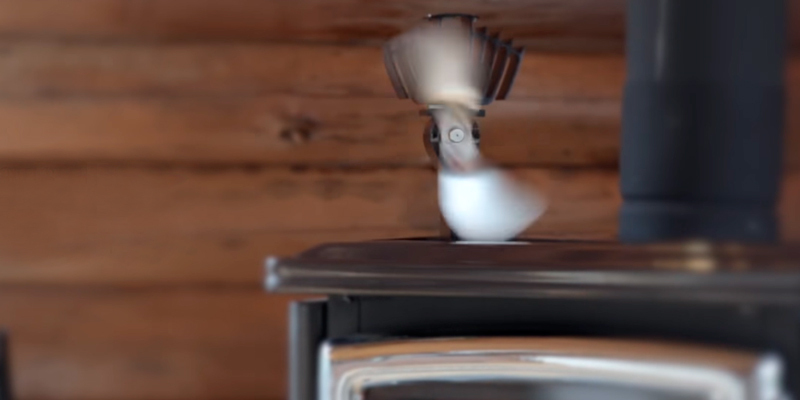 Just like most of them, the fan in question uses the heat of the stove surface as fuel. 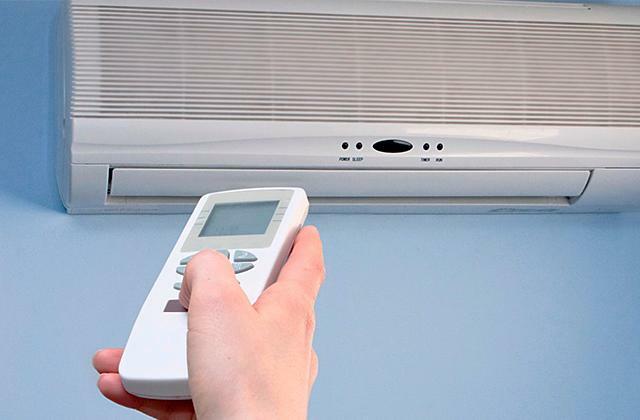 Since no batteries or electricity is required, a tool like that isn't just an effective solution when it comes to air distribution but also a rather cost-effective option that will allow you to save some money instead of wasting it on batteries or on an increased electricity bill. And, again, just like most of these fans, the model automatically adjusts its speed in accordance with the temperature of the stove surface. It starts to work when its temperature reaches 185ºF and it is capable of doing so until it reaches the temperatures in the ~650ºF range. 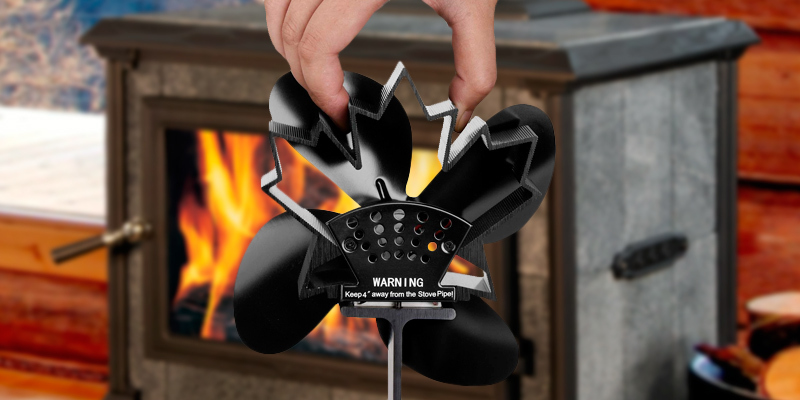 But you won't have to worry about that since this wood stove fan comes equipped with a bi-metallic safety device implemented in the base of the fan. 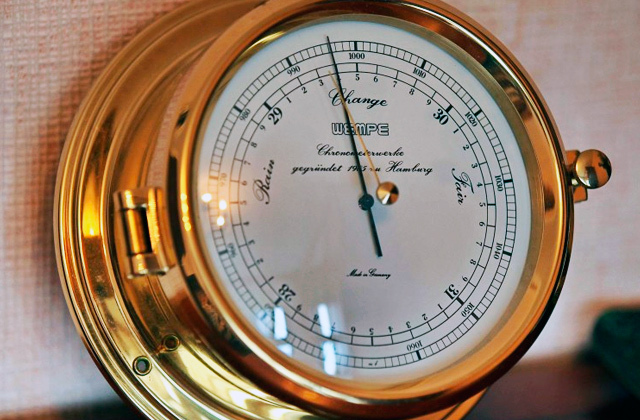 If it ever so happens that the temperature of the surface will reach the aforementioned number or even rise well above that, the said safety device will gently elevate the front of the fan to protect the TEG and motor. Aside from that, we would be remiss not to mention the model's compact 6.7" x 3.6" x 8.7" of overall dimensions that will allow you to easily find some space for it on top of the stove. So, should you get this fan? Well, the short answer is yes. Despite the compact design, the model does not trail behind some of the bulkier fans in terms of performance, so it will be able to cover a pretty sizable room and make it a much warmer environment without requiring much of an investment on your part. It definitely isn't the most important aspect of this product but the first thing that catches the eye here is definitely its design. As you can infer from the picture, the blades here are connected to a foundation shaped like a maple leaf. Personally, we find it charming. It doesn't improve the model's performance but it definitely helps it stand out from the crowd. Unfortunately, with this unorthodox design solution, the manufacturers were forced to sacrifice the handle. It isn't a huge drawback since you don't really carry wood stove fans from one place to the other but it does make things slightly more inconvenient. But if you don't care about the way your stove fan looks, don't leave just that. Despite the lovely appearance, the model is anything but. 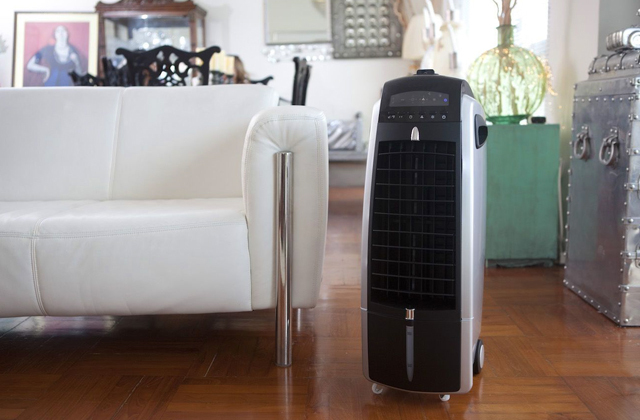 Capable of outputting 350 cubic feet per minute, the fan moves much more air compared to the majority of its counterparts. 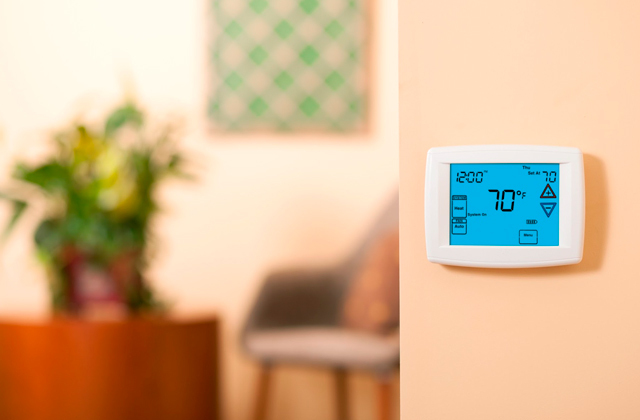 Thanks to this factor, it will be able to keep a much larger room nice and warm and will take a lot less time to warm that room up. 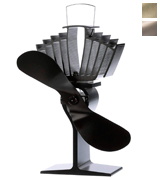 Other than that, this is more or less your standard wood stove fan. It doesn't require batteries or electricity to work. Made of anodized aluminum, the model handles temperatures up to 662°F (350°C) without deformation or discoloration, even after working under these kinds of temperatures for a long time. Finally, the blades incorporate increased width and a unique shape, a nice little design solution that lets them better distribute warm air. Bottom line, the model from CWLAKON is one of the most visually appealing and cleverly designed options on this particular market. But don't let its delightful appearance fool you. As far as wood stove fans are concerned, the model is an absolute powerhouse that is second to none when it comes to performance. There's nothing quite like a wood stove when it comes to improving the atmosphere and the overall vibe in the living room. That said, despite the fact that they were originally designed for this very purpose, wood stoves aren't always quite as effective in terms of even heat distribution. But, with a wood stove fan, you will easily be able to fix this unfortunate flaw of theirs. As you might have already figured out on your own, a fan like that is a simple tool that is used to distribute the warm air generated by a wood burning stove to the surrounding area. 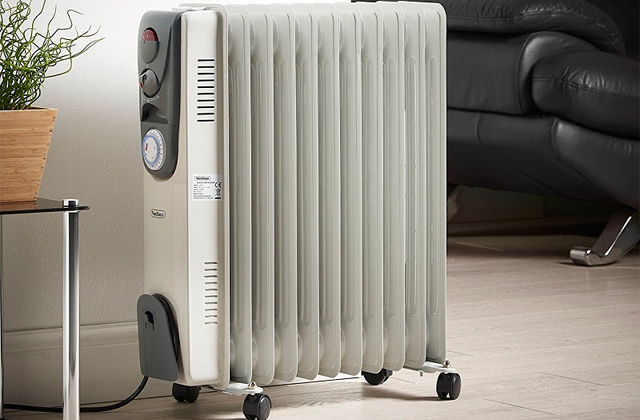 Despite their often small size, these little machines are capable of making a pretty sizable room much warmer, with some help from the fireplace, of course. They don't differ that much from each other but you might want to pay attention to the model's CFM numbers as those will determine the force of the airflow and to the operating temperatures since the latter will tell you what kind of temperature your wood burning stove fan will be able to handle. Now, even though a fan is a fan, there are a few things that make these specific fans suitable for this specific purpose. So if you want more of a general-purpose fan, we would recommend our reviews of pedestal fans and personal fans.